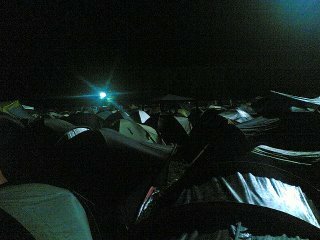 Today I realised that these 5,000 extra people who came to Lowlands were all British. There are sooo many Brits here compared to last year, and you can’t walk a few yards without hearing a British accent. It’s getting to be like Amsterdam. The day got started with Emo pioneers Hawthorne Heights, a band who pretty much created the template for Emo, which is Goth’s teenage daughter who “didn’t ask to be born!” Successful Emo bands only usually have one album as after that they have girlfriends and have moved out of their parents’ home. The band gave a good performance to a moderate group of waking campers. During the hunt for food we caught a few snippets of Psapp’s pleasant, jazzy soft pop but unfortunately settled within earshot the Bad Karaoke area, where people deliberately sing badly to bad pop songs. It was torture and I really felt for the poor souls who have to work underneath who had to listen to it all hours of the day. After eating it was time to catch some of industrial pioneers Ministry, commendably performing their originally sequenced hits with a live band; and very faithful reproductions they made. It feels odd to describe the heavy wall of sound that is Ministry as nostalgic, but it was. There was a time I was quite into this sort of thing and I still maintain there are few better songs to throw yourself around the room to than Jesus Built My Hotrod. The Third-Reich style banners and the microphone stand resembling an ornate metal pulpit gave the effect of a cult preacher, ministering down to the “Lowlands motherfuckers.” For those of you who don’t know, the word according to Al Jourgensen, is that the world is diseased, corrupt place and we are all going to die at the hands of those in power. However, if your hotrod happens to have been built by Jesus, you might have a little bit of fun before you go. We were a little late for Be Your Own Pet, which meant we only saw a couple of songs. BYOP’s sets, like their songs, are very short and highly energetic. They make me think of Siouxie and the Banshees with the speed set to 11 (instead of 4). They seem to do the thing BIS wanted to do, but BIS failed miserably. We then wobbled around the silent disco for a few minutes before the next appointment: The Raconteurs. With an impressive lineage, it is no surprise much is talked of The Raconteurs. They play stripped-down 1970s rock with Deep Purple and even The Who moments. Dirty Pretty Things were next. They play what I imagine Pub Rock (as in the precursor to punk) to have sounded like, but I was far too young to go into pubs at the time. We then wondered down to catch some of The Streets, which to some is urban poetry and others off-key, mis-scanning rapping. They were finishing up their set with an audience participation bit and most bands sound arrogant when they’re doing that, so I am unable to say if the band are actually as arrogant as they’re supposed to be. The next big appointment was with one Iggy Pop, grandfather of punk and crazy old man of the pop world. Iggy gives his all at gigs, rolling on the floor and throwing himself about the way 60-year-olds shouldn’t be able to. Iggy still can fling himself around like a 20 year old and although the performance was spirited, the songs tended to blend into each other. There really wasn’t much variety in the way they were performed. So much so, most people didn’t notice he did “I Wanna Be Your Dog” twice. Woof woof. 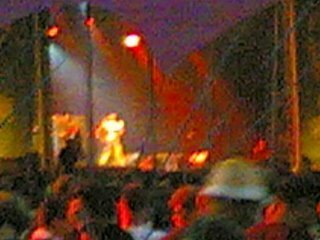 Prize-winning photo of Iggy Pop performing one of his many blurry hits. After listening for a short while to crazed folk punksters Gogol Bordello from a distance, I took my leaden legs home to bed, forgoing the slapstick extroversion of the silent disco.